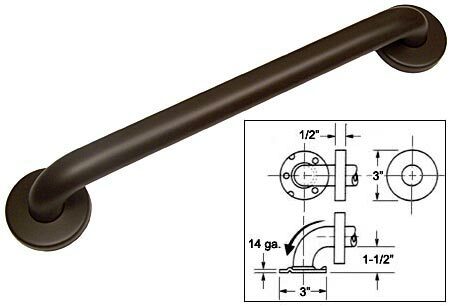 Seachrome offers commercial grade grab bars that meet all building codes for use where maximum safety, durability and reliability are mandatory. Made from #304 stainless steel; Finished in durable, powder-coated oil rubbed bronze. .049in. (18ga.) wall thickness x 1-1/4in. diameter tubing. Meets and exceeds the minimum 250 lb. load requirement when properly installed. Concealed screw flanges with a snap-on cover. Warranty: 1 year limited warranty. Necessary matching installation accessories included.